Sorry, I was being a smartass. I thought you had a 3.3 I6 based on your username. Bummer about the radiator. Should do a pressure test on it like was suggested in the comments. I believe auto parts stores will rent you a tester. Last edited by Monty78; 11-03-2018 at 11:36 AM. I was 80% sure I wasn't getting whatever the joke was...Makes sense now. So my gut was right but I couldn't figure it out. Pressure tested the radiator today and confirmed the leak. Not that big, but enough. Looking at some on RockAuto, but I can't say I have ever heard of Liland Global Aluminum radiators. Wanted to make sure that's not on one of those lists of "stay away". Turns out it was the timing...runs pretty good now! I think they just started carrying Liland a few months ago. I don't have any experience with them. The look strangely hand fabricated not that that is a bad thing, but if you are going for the OEM look then the Spectra looks like the one. There are a ton of places online that sell only radiators and other heat exchangers for cars. That might have more selection. How many rows is the radiator that is currently in the car? Yeah, I had never heard of Liland until just this week, when I went to Rock Auto and it was one of the brands highlighted in the "What's New" window that pops up. All aluminum for mid-$100 is pretty nice, if they're good quality. I caught up with this guy who's in Omaha, NE. I'm in KC Metro (Kansas Side). He wasn't hungry enough to meet me halfway down I-29. So I calcuated the gas for me, it'd be right around $20 to make that trip. If he can ship it for less than $25 I'll probably snag it. What's the best way to tell how many rows? I'm assuming on the sides or bottom there are the pipe loops that stick out, and that's what I'm looking for...how many are stacked upon themselves? Open up the radiator cap and look inside. See those black oval shaped holes? Each one (front to back on the car) represents a row. Top to bottom in that picture I count three rows (you can see two and then only part of the third). My guess is your radiator is a two row, but it's always better to check before ordering. 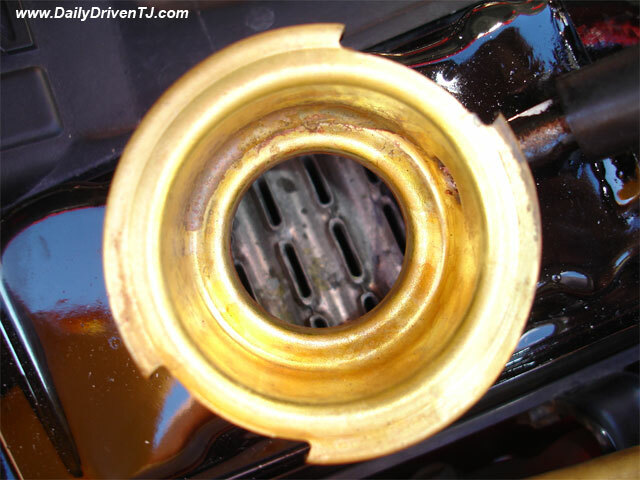 Does your current radiator have brass or plastic end tanks? If it is brass you might be able to have it repaired at a good radiator shop (if you can find one). I'm really at a loss as to how to get the thermostat housing off without removing the A/C compressor or distributor. Any pointers? I vaguely recall using a long open end wrench to turn that bolt 1/16" at a time. Seemed to take forever. Lots of cursing. In an odd way, this is comforting. To know that someone else doesn't see any other way. I'll have to consider this. Was thinking maybe I could remove the vacuum advance of the distributor to free up some space, but not sure. On my mustang I used a distributor wrench on the thermostat housing, but I have a different accessory setup. Maybe a 'crow-foot' wrench on the end of a ratchet extension. I ended up taking off the vacuum advance timing cone on the distributor. Now the one bolt was torqued ridiculous I ended up cracking the thermostat housing in the process. But a normal open end wrench got in there. Hate cheap thermostats! I’ve changed more thermostats from the mcparts store then I care to think about! Get a Motorcraft ! Yes well said, this was the lesson learned. Can't be stated enough!